Technology continues to advance, connecting not only our computers, tablets, and phones to the internet, but also our appliances, home security systems, and personal biosensors. As a result, keeping data private and devices secure has become a top priority for both business corporations and the government. This increasing need for people trained in computer technology and security has helped employment in the IT industry grow 37% since 2003 -- much faster than average. Professionals with an online master's degree in internet security, or cybersecurity, work to protect a company's data and information by identifying threats and preventing malicious cyberattacks with software, hardware, and the latest technology. Completing an online master's degree in internet security program will prepare you to assess a company's computer security needs, make technology recommendations, and execute plans for the implementation and management of safeguards. The best online master's in internet security programs will also provide additional management and leadership training, qualifying graduates for director and supervisory positions. Because cybersecurity is of national interest, most online master's in internet security programs align with National Security Agency guidelines and feature core classes that focus on network management, computer forensics, and, of course, security. However, the best online master's degree in internet security programs can differ in their emphasis. Some programs specifically offer an online master's degree in internet security, while other programs offer degrees in information science or information technology with a cybersecurity concentration. Other schools offer dual MS/MBA degrees for people aspiring to executive-level positions, such as Chief Information Officer. Programs that offer an online master's in internet security can often be specialized even further with concentrations, such as white-collar crime, cloud computing, and cyberwarfare. Many curriculums also fulfill the requirements for attaining special certifications, including Certified Information Systems Security Professional and Certified Information Security Manager. Iowa State University ranks #1 on The 10 Best Online Master's in Internet Security Programs! Located near Des Moines, ISU is known internationally for its science and technology programs. ISU offers two online internet security programs: a master's of science and a master's of engineering in information assurance. Neither program requires in-person attendance. Students learn to defend information systems against accidental and malicious breaches. The MS in information assurance requires 30 credits, including coursework in advanced computer networking, information warfare, and cryptography. MS students complete a thesis to demonstrate their ability to conduct independent research. The ME also consists of 30 credit hours; however, students complete a capstone project instead of a thesis. ISU offers online classes in multiple formats. During synchronous classes, students interact with professors and peers in real time. Asynchronous, cohort courses allow students to access materials and assignments at their convenience. Assignments and exams may follow a weekly schedule or be self-paced, with milestone deadlines. Distance learners have access to an online library, writing center, and tutoring center. The online academic success center provides supplemental instructions and academic coaching. Applicants must have at least a 3.0 GPA and a quantitative GRE score of 700 or better. ISU is regionally accredited from the Higher Learning Commission. Brandeis University ranks #2 on The 10 Best Online Master's in Internet Security Programs! Brandeis, a private school in Boston, Massachusetts, offers a master's of science in information security leadership that prepares students to address information security concerns both nationally and globally. The program instructors are experts in the field and teach students to construct business cases for investigations and risk management. Students learn how to inform clients about the importance of investing in information security and are equipped to plan, acquire, and manage the development of secure infrastructures. The curriculum includes courses in information security management, leading security in complex organizations, and information technology forensics and investigations. The 30-credit program comprises six core courses and four electives. Students complete classes asynchronously in 10-week sessions. Weekly calendars contain mandatory and optional reading material, assignments, and discussion boards. Most students devote 9 to 15 study hours per week to the fully online program. Brandeis' average class size is 12 students, allowing professors to provide detailed feedback for each student. Professors offer virtual office hours and review sessions for distance learners. Brandeis accepts transfer credit and has no GPA or standardized test score requirements for applicants. Brandeis is regionally accredited by the New England Association of Schools and Colleges. Robert Morris University - RMU Online ranks #3 on The 10 Best Online Master's in Internet Security Programs! RMU is a private school located near Pittsburgh, Pennsylvania. The university is known for its exceptional online programs, including the online master's of science in cyber security and information assurance program. The specialized degree prepares students to design and develop systems that identify and combat threats to information security. The 30-credit program includes courses in microcomputing technology, system analysis and design, and secure programming. RMU offers a concentration in enterprise systems, which focuses on developing and managing secure enterprise information systems. Students complete a program outcome assessment, which is pass or fail and may include an exit interview survey. Online students have 24/7 access to course materials and must meet deadlines for discussions, assignments, and assessments. Classes follow an eight-week schedule, and students can complete the program on a full- or part-time basis. Each distance learner has access to a student services team, which provides program planning and supplemental resources. Online students have access to career advisors, wellness counselors, financial aid counselors, and technology support. Distance learners can participate in study abroad experiences. Applicants must have at least a 2.0 GPA. RMU is regionally accredited by the Commission on Higher Education Middle States Association of College and Schools. Lewis University ranks #4 on The 10 Best Online Master's in Internet Security Programs! Lewis is a Catholic school with locations in Romeoville, Illinois, and in Albuquerque, New Mexico. Known for its diverse student population and the value it places on justice, Lewis offers a master's of science in information security that prepares students to defend organizations against breaches. The curriculum covers risk management, information technology assets, how to identify vulnerability, and the communication of ethical and privacy concerns. The program requires 35 to 41 credit hours, including a capstone course. The program offers two concentrations: technical and management. The technical concentration provides a hands-on approach to securing information systems and includes courses in cryptography, network security, and security protocols. Students in the management concentration develop skills in design and maintenance of IT infrastructures and security controls. The concentration includes courses in ethical hacking, risk management, and information security governance and compliance. Both concentrations prepare students to pass the Certified Information Systems Security Professional exam. Classes are fully online and follow an eight-week schedule. Applicants must have at least a 3.0 GPA. Lewis accepts transfer credits earned with a grade of B or better. Lewis is regionally accredited by the Higher Learning Commision. 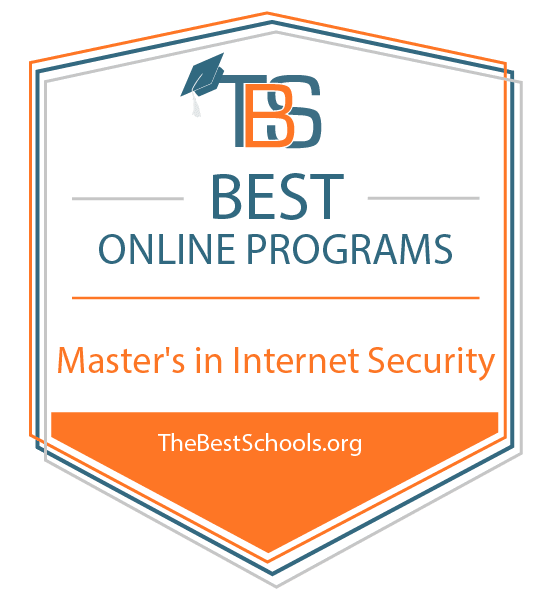 Sam Houston State University ranks #5 on The 10 Best Online Master's in Internet Security Programs! Located in Huntsville, Texas, SHSU offers rigorous online programs, including a master's of science in information assurance and security program that is ideal for students with an undergraduate degree in a technical field, such as management information systems. The 36-hour curriculum covers principle and policy information, assurance and business continuity management, public formation, and risk management. Students learn to assess threat levels and organizations' vulnerability by identifying compromised enterprise IT systems. Online students complete two 16-week semesters during the fall and spring and two 4-week sessions during summer months. SHSU delivers online courses asynchronously, so students can complete coursework according to their schedule, and the program does not require a capstone project. Each professor provides a syllabus containing due dates for discussions, assignments, and assessments. Distance learners have access to an online support desk and a creative services team specializing in production and media. Applicants must have at least a 3.0 GPA. SHSU awards credit for professional experience. SHSU is regionally accredited by the Southern Association of Colleges and Schools Commission on College. Florida Institute of Technology ranks among The 10 Best Online Master's in Internet Security Programs! Located in Melbourne, Florida Tech's programs focus on the advancement of science and technology to positively impact society. The school's online master's of science in information assurance and cybersecurity prepares students to meet corporations' growing demand for skilled professionals to address cyberthreats. The curriculum covers topics such as cryptography and hidden information and explores how information is filtered through encryption, watermarking, and steganography. Coursework in areas such as biometric authentication technologies exposes students to technologies that assess fingerprinting and facial biometrics. Students learn to design, apply, and assess biometric systems. Most students complete the fully online, 33-credit program in two years. Distance learners have access to student service representatives and 24/7 technical support. Florida Tech provides an online library and free online tutoring. Online courses last eight weeks, and students can access course materials at their convenience. Florida Tech does not require GRE or GMAT scores, and transfer students can submit previous credits earned with at least a B- for approval. Florida Institute of Technology is accredited by the Southern Association of Colleges and Schools Commission on Colleges. Western Governors University ranks among The 10 Best Online Master's in Internet Security Programs! WGU is a nonprofit school that provides flexible online programs. Although headquartered in Salt Lake City, WGU has offices throughout the United States. WGU's self-paced programs use a qualitative learning progression; students demonstrate their progress by proving their understanding of coursework. This structure allows students to focus on practical competencies rather than credits. WGU's master's of science in cybersecurity and information assurance includes coursework in forensics and network intrusion and security policies and standards. Graduates offer organizations reliable defense against cyberthreats. Most students complete the program within one year. The program follows six-month terms and offers start dates each month. Students benefit from WGU's nationwide alumni network. A mentor helps each student achieve personal goals throughout the program. WGU offers online research assistance, libraries, and webinars. Distance learners can contact librarians through an online chat service. WGU does not accept college transfer credits at the graduate level. National University ranks among The 10 Best Online Master's in Internet Security Programs! NU is the largest private, nonprofit school in San Diego. The university offers accelerated online programs, with four-week classes, to help working professionals advance their careers. NU's master's of science in cybersecurity and information assurance requires 58.5 quarter units and prepares students to lead with justice, authenticity, and control. Students learn to design, operate, and manage information systems. Coursework provides skills in analyzing risk assessment methods and strategies, conducting in-depth research, and developing mitigation plans against external and internal weak points. Online students have 24/7 access to course materials. NU's hands-on virtual learning environment utilizes group activities, discussions, presentations, and emails. Distance learners complete assignments and exams fully online. NU offers start dates each month and offers transfer scholarships. Applicants must have at least a 2.5 cumulative GPA or a 2.75 GPA in their last 90 quarter units. Applicants with a GPA of at least 2.5 do not need to submit GRE scores. NU is accredited by the Accrediting Commission for Senior Colleges and Universities of the Western Association of Schools and Colleges. Dakota State University ranks among The 10 Best Online Master's in Internet Security Programs! Located in Madison, DSU's nationally recognized faculty teach respected programs in computer management and information systems. Both the National Security Agency and Department of Homeland Security recognize DSU for excellence in information assurance. DSU's online master's of science in information assurance and computer security prepares students to defend information systems, implement individualized security strategies, administer technical leadership, and develop innovative security alternatives. The curriculum covers principles of information assurance, managing security risks, offensive security, and incident response. The program requires 30 credit hours, and students complete an exit examination during their final semester. Online classes follow traditional, 16-week semesters and offer 12-week summer sessions. DSU provides an interactive virtual learning environment, and students can access course materials 24/7. Students have access to online tutors and personal counselors. Online students pay a per-credit tuition rate, which includes few administrative fees. Transfer applicants should have a cumulative GPA of 2.0 or better. Hampton University ranks among The 10 Best Online Master's in Internet Security Programs! HU is an historically black institution located in Virginia. The university offers a master's of science in information assurance that prepares students to provide reliable and ethical solutions to major security threats and to develop strategies for improving security across industries. Students analyze recent trends and advancements in the field and practice communication skills to ensure key stakeholders understand systems and potential risks. The curriculum requires coursework in computer viruses and malicious software; secure distributed computing; and ethics, law, and policy in cyberspace. The two-year program requires 24 core credit hours and 12 elective hours. Online programs follow traditional semesters, and class materials are accessible 24/7. Distance learners meet deadlines for assignments, class discussions, and assessments. HU provides an online library with assistance available by phone and chat. Online students can schedule appointments with the online writing center and the counseling center. Applicants must have at least a 3.3 GPA, and transfer applicants must have a 3.0 GPA. Hampton University is accredited by the Southern Association of Colleges and Schools Commission on Colleges. Because just about every company in all industries uses computers to do business, an online master's in internet security can lead to a job in most fields. Even graduates who desire to work for themselves can easily do so with an MS in internet security, as graduates with this degree often find work as consultants. Computer Systems Analyst: This position suits those with an information science or IT degree with a cybersecurity emphasis. Computer systems analysts do not focus solely on security. They also help a business or organization use technology to improve productivity and processes. They stay on top of emerging technology trends, designing and configuring software and hardware to maximize efficiency. Information Security Analyst: This is the most common and fastest growing position for people with a master's degree in internet security. Information System Analysts monitor computer networks for security breaches and defend against hackers and cyberattacks by developing encryption programs, firewalls, and security protocols. They repair systems that have been damaged by viruses and other malware. Employers often expect in-depth knowledge and experience, making a graduate degree preferable over a bachelor's. Computer and Information Systems Manager: Computer and Information Systems Managers oversee an organization's technology and computer-related activities. They work with both computer system analysts and information security analysts to implement technology updates, schedule maintenance, and plan security strategies. This position often shares duties with a company's Chief Information Officer or IT Director. Most supervising positions require a graduate degree that computer system analysts advance into.